As I’ve said in previous posts, I started collecting these old horror paperbacks when I was a boy in the late 1970s. I was well aware of Dennis Wheatley at this time as I had his book ‘The Devil and All His Works’ on a semi-permanent loan from our local library (remember that wonderfully atmospheric Goya cover of the Devil in his guise as a Black Goat dancing in the middle of a witches’ Sabbath?). I also had several of Wheatley’s paperback novels as they were so plentiful at the jumble sales and junk shops I purchased my books from with my meagre pocket money. 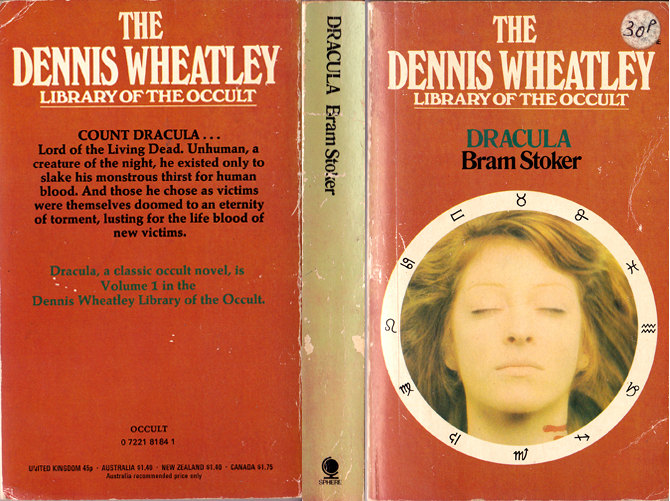 Far more difficult to acquire at the time were the mysterious series of books under the title of Dennis Wheatley’s Library of the Occult, these were the ones that set my imagination racing. These were books I would only catch rare glimpses of, and I only managed to nab a few of them in my younger days, but they did always contain a list of other books in the series. 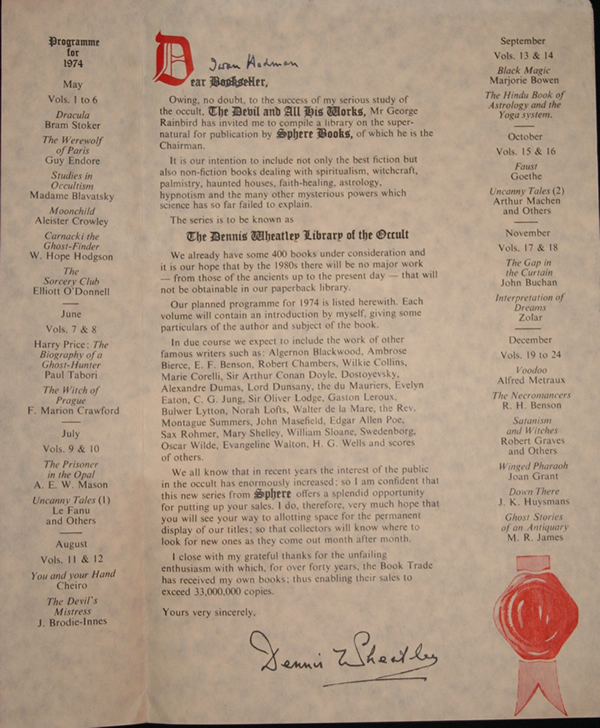 All those wonderful titles and each with an introduction from Wheatley himself. I was convinced that if I managed to find and read the entire series I could indeed become a master of occult forces. However, knowing what I was like as a 10 year old, it was probably for the best that the whole series, and thus the mastery of Magick, eluded me. Over the years I have continued to collect them and I thought it was about time I included the whole series of 45 books here in the Churchyard. One book at a time, of course. As can be seen in the wonderful image below of the promotional pamphlet for the series, 400 books were in consideration for the ‘Library’ and it was intended to continue into the 1980s. Sadly, Wheatley passed away in 1977, so we have just the 45 books published between 1974 and 1976. Still a wonderful legacy though. Many thanks to Charles Beck who runs the wonderful resource for all things Dennis Wheatley at www.denniswheatley.info for the loan of this image. So, starting at Volume 1 in the Dennis Wheatley Library of the Occult, we have that classic of vampire literature, Dracula. Do I need to say that it’s by Bram Stoker? There’s really not much that I can say about this novel that hasn’t been said a hundred times before, which is why I’m conveniently using it for the introduction post to the series. What does strike me about this novel is that I can’t think of a novel prior to this one which is built around a small band of adventurers, each with their own particular skill set. This is something we’re very used to today, it’s a staple of films and tv series (just look at that other great work of vampire fiction ‘Buffy’), but was there anything similar before Dracula? Obviously we have individuals or pairings, like Holmes and Watson for instance, but were there any other small bands of disparate characters coming together to battle the forces of evil before Stoker? Obviously we have older tales such as those of Robin Hood or the Arthurian cycle but I’m struggling to think of any ‘modern’ novels. I’m sure there must have been, but none spring to mind at the moment. So, here it is . . . Dracula. If you’re reading this blog and there is any chance that you haven’t read it, perhaps you think you already know the story as it’s so famous so why bother, then just read it. It certainly wasn’t the first vampire tale ever written, it’s perhaps not even the best vampire tale ever written, but it was undoubtedly the most influential vampire tale ever written and a splendid piece of Victorian Gothic to boot! I’ve never read Dracula. I just never seem to get around to it, probably for the reason you gave, I feel I already know the story. I’ve only got one book in the Library of the Occult series; Black Magic (by Marjorie Bowen I think). It’s a story that has stayed with me for many years and I’ll be interested to read your views on it when the time comes. Thanks very much for your comment. Dracula really is a terrific romp and well worth a read, Stoker’s characterisations are wonderful and there’s still plenty of surprises in the novel even if you think you know it. I think Bowen’s Black Magic is number 13 in the series so, with the speed (or lack of) that I get around to posting, it could be a while yet! Still, I’ve been working on number 2 and that should be up in the blog tomorrow. Onwards! I never thought of the Robin Hood tales in the category of “a small band of adventurers, each with their own particular skill set” but they are exactly that. Thanks for the new perspective! It’s so good to see these again Mr Nash, I too collected this series at pretty much the same time so I share the nostalgia factor with you. Dracula is about as seminal as it gets in terms of horror fiction, can’t wait to see what else you dig up from the vault. All the best to you and Sam. Just found this blog. Very cool stuff. You have the entire occult library collection? I have other editions of quite a few of the books in the series, but the only Wheatley version I own is Huysman’s ‘Down There’. Also, Dracula is the book that got me hooked on reading. Love it! Thankyou for your comment, de Richleau (or may I call you Armand?)! That’s quite a wonderful blog you have there yourself, I’ll look forward to reading through it.